Decluttering is a 21st-century tidal wave, a self-help methodology that can be applied to improve every area of our lives. Across the media, experts rave about the practical and psychological benefits of cleaning and tidying, citing more space, more headspace, time savings, less stress, and greater clarity. I have to admit; I’m a convert. Are you? If so, you may have already decluttered your wardrobe and your desk. But have you decluttered your CV? If not, it’s time to take a look. Here are three questions you can use to declutter your CV content and create the best possible first impression. When discussing wardrobes, organising consultant, Marie Kondo recommends taking each garment in your hands and asking ‘Does this spark joy?’ If the item triggers a thrill of pleasure, it’s a sure-fire sign that it should stay. The same approach can be used to declutter your CV. Consider each profile statement, each skill, each bulleted career story as a standalone item. Does it make you happy? Does it narrate a skill or experience you enjoy? Are these projects or results aligned with your personal brand? If your CV content doesn’t spark joy, pleasure, pride, or excitement, it isn’t serving your needs and is ripe for the chop. Cut out any humdrum content and make room to wow your next employer with exciting, relevant skills and stories that fill your heart with pride and joy. Even with the biggest of wardrobes and broadest range of clothing, the majority of us wear just a small percentage of our available choices most of the time. 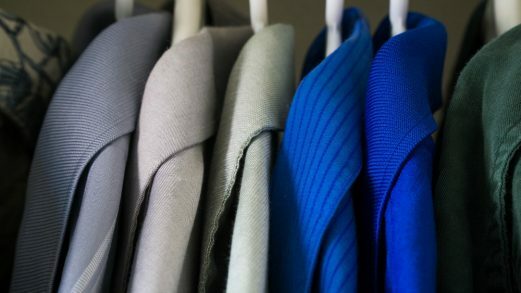 Our lives move on and our attire changes, but it can take a while for our wardrobes to catch up. Why do we hang on to clothing that we don’t ever wear? Whether it’s ‘just in case’ or ‘you never know’, the result is a crowded and confusing space. A friend told me that you should take every item out of your wardrobe then replace the clothing with the hanger openings facing the back of the wardrobe. When you select and use a garment, put back the hanger in the usual way. After three months it should be easy to see which have been used and which neglected. Unused, unloved items are prime for recycling. Much like that dress at the back of your wardrobe, the one that you hang on to ‘in case’, but isn’t the right fit or colour, redundant CV content should go. Old skills, career stories, and training courses can outlive their relevance or purpose, yet continue to consume prime CV real estate, crowding your CV and distracting from your intended message. As when you clean your wardrobe, a thorough CV edit will create white space to frame your valuable content, making it far easier to read. How about the overall picture? When buying a new garment, it’s easy to forget your outfit as a whole. Style experts recommend developing a capsule wardrobe where items can be interchanged to create several fit-for-purpose outfits. When writing your CV, consider how your skills and career stories complement each other to create a compelling USP. Starting with the end in mind, research job adverts and descriptions for target roles. Make an inventory of essential requirements and check off the skills and career stories you already present on your CV. The missing items can be your shopping list, experience or skills to acquire and feature. List new skills to reflect job advert terminology and apply the Challenge-Action-Result formula to weave new experiences into powerful bullets. Like the clothes you wear, your CV has the power to make or break your first impression. Audit your CV content to ensure it makes you happy, serves your needs, and delivers a purposeful and coordinated picture of what you can offer. Lis McGuire is a professional CV writer and the founder of Giraffe CVs. Her mission is to help her clients to aim high, stand tall, and get spotted through interview-winning CVs and supporting career documents. Her book, Ace Your CV, Elevate Your Career, provides a step-by-step guide to help job seekers create their best CV and LinkedIn profile.